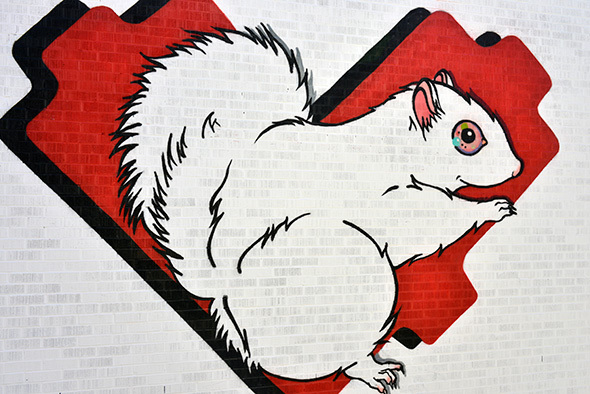 White squirrels just got a whole lot easier to spot thanks to a giant mural in a laneway next to Trinity Bellwoods Park. Toronto's Lovebot team are behind the simple, but effective laneway mural behind Nadege and the Saint Nicholas Ukrainian Church. Placed at the back end of the cafe and pastry shop, those hanging around in the southeast corner of the park have a good angle to take in its iconic animal representative. It's also a vast improvement over the drab aesthetics of an alley that's usually used as a shortcut for cars and dog walkers. The squirrel's kaleidoscopic eyes keep a watchful eye over the passersby, as it sits on a traditional Lovebot heart. Hopefully it inspires a new army of real white squirrels that take over the park. Failing that, it helps to solidify our fascination with the creatures.